This is an AEC Regent III of Nottingham City Transport, body by Charles Roberts of Wakefield. The location is Nottingham Old Market Square. This series were purchased (I think) about 1948/9 and ran until the mid/late 1960s. (Latterly they were renumbered into the 400 series I believe). As built they had heavy traffic indicator arms that dropped back into their recesses after use with a satisfying thud. 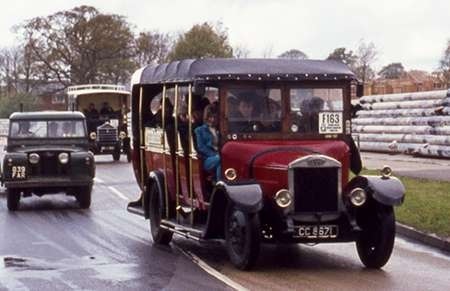 In the earliest days I can remember (1951-54) they monopolised the three Nuthall Road routes (1, 7 and 22) which served our area. 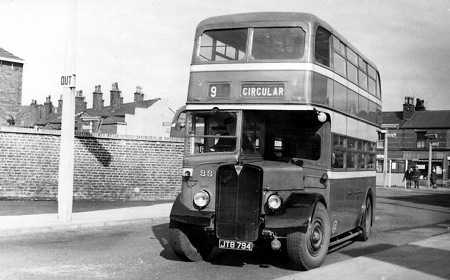 These started from the steep incline of Hanley Street, round the back of the Theatre Royal, and the buses were provided with a stout metal wedge on a chain, which was jammed under the front off-side wheel while standing there, to avoid accidents. My favourite buses. We lived near the No. 1 terminus in Aspley, and were well served by the earlier of these (301 to 324) for many years. Hi Harold. So you were somewhere in the Rosslyn Drive area? As a little lad, I lived in a prefab on Aslockton Drive, so we always boarded at Bar Lane (just after the No. 1 had swung right out of Melbourne Road. Do you remember that there was a time clock at this stop, and conductors had to "clock in" before the bus could proceed? If they were a bit early, they would rattle the handle up and down, trying to make the clock jump forward a minute. I seem to remember the Roberts were later rather disfigured internally by having the fluted "jelly-mould" light fittings removed, leaving naked bulbs instead. Stephen, there was also the time clock on Mansfield Rd.,where amongst other buses the 69 or 52 from Arnold would pull up at on our route in to the City from my grand parents house on High St., seems such a long time ago now. Hi Stephen. We lived on Eltham Drive and later moved to Valley Road at Sherwood. There was a similar clock at the Valley Road/Hucknall Road junction, used by the 2, 6, 17, 18 & 28 routes. Would you have a photo of one of those buses on the 1 route or one of the routes I have just mentioned please? Yes, I think you are right about the lampshades. Roger and Harold, Regarding the time clocks, there was quite a number of them. They were on inward journeys to "City" and noted in the timetables, usually as the only intermediate timing point. From my 1971 timetable, they were at Villiers Road (Mansfield Road services – 10, 20, 52, 57, 69, 73, but not used by the 25 circular), "Valley Road Clock" (Hucknall Road services 2, 6, 17, 18, 28), Bar Lane (Nuthall Road services 1, 7, 22), St Margaret’s Church (Aspley Lane services 16, 16A, 30, 32, 62, 74), Hillside (Derby Road services 5, 19, 45, 63), Old Market Square (former trolleybus routes to Trent Bridge, 41, 43, 46 + 75), and Cardale Road (Sneinton Dale services 3, 59). Harold, the same lamp fittings were used (and later left off) on the post-war trolleybuses, and the big batch of Park Royal AECs built around 1952-4, but they were mounted the other way up, which always struck me as ungainly and "upside down"! Funny the details that attract the notice of a 4-year old! Nothing to do with the bus, Stephen, but why is the tower in the background at a different angle to the building in front of it? Are they unrelated edifices? Interesting memories – the thing I remember most about NCT’s Roberts Regent IIIs is the seats – a different style from other NCT vehicles of the period and far more comfortable. In the early 1950s there was a time clock for 42,43,44 trolleybuses on Radford Rd, next to the school near Egypt Rd (inwards). This was moved during the late 50s/early 60s to the stop on Vernon Road just the Bulwell side of the Shoulder of Mutton (ring road). There was also one in Old Market Square in trolleybus days at least, at the stop outside the Bell Inn for 42, 43, 44 (outwards). This has started something hasn’t it?! Chris, the clock-tower is indeed part of the building – known as Lambert’s factory (one of the correspondents on Nottstalgia farther down the forum mentions its conversion to offices, and the partial collapse that happened at that time). Why it is set at an angle, square-on to the top of Hanley Street, I don’t know. Bob, yes I was unsure about the northbound timeclock in the OMS (Beastmarket Hill). The timetable I have gave no clue about the Vernon Road one either. It quotes Basford Northern Baths as a timing point, but of course that was the terminus of the 42 anyway. I suspect there may have been others earlier. Did other cities use them? I never spotted any. Stephen – re the clocktower of Lamberts building, I seem to recall reading sometime that the tower sides are aligned to face geographic north south east west. Re timeclocks, an equivalent used in the Birmingham area for many years was the Bundy time clock. Thanks Stephen. I thought I had seen a photo of 307 somewhere, and this must have been it. 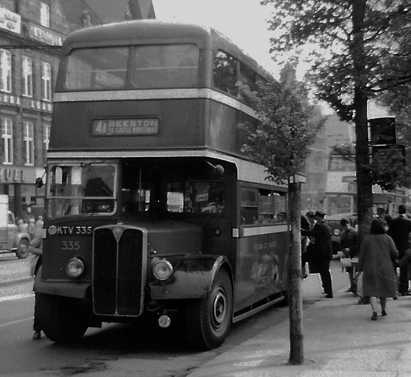 Sheffield had quite a number of Roberts bodied Regent III in 1948/9 for both the A and B fleets. They had a slightly different (a bit old fashioned) appearance than this Nottingham example. I remember the rather heavy rain deflectors over the saloon windows, the bulge to the cab front panel which doesn’t seem to be there in the angle of the shot of the Nottingham vehicle. Sheffield specified sliding windows rather than half drops. Both sets of bodies were of four bay construction which was rather unusual at that time being more of a 1950s design. Re Bob Gell’s comments, the Sheffield Roberts bodies also had passenger seats different from any others in the fleet having higher backs. I think Roberts made a more pleasing design of body for the 35 tramcars built for Sheffield in 1950-1952. Stephen – do you recall that the ‘Roberts Regents’ came in two ‘varieties’. a) three half drop windows per side on both decks and glass lamp covers. b) four half drop windows per side on the upper deck and two per side on the lower deck but no lamp covers. Can anyone remember where the split between the two ‘species’ came in terms of fleet numbers? The recorders at St.Anns Well Road and Bath Street were also used as crew relieving points known as Bath Street Junction and Bath Street Clock respectively. Hi Michael, Thanks for this. I was sure there were more clocks than I was able to infer from the timetable. Now you mention it I do remember waiting for time at the GedlingRoad/Westdale Lane stop on the 25 – wasn’t this stop called Dr Parks’ Corner, or was that the Burton Road/Gedling Road stop? I hadn’t realised the differences between the two batches of Roberts Regents. It was my impression that both started out with the glass jelly-mould lamp fittings, and both lost them towards the end – though I could be mistaken. 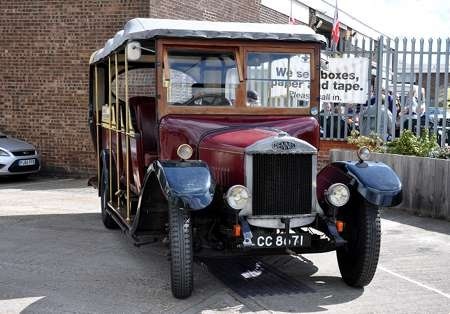 (They also featured on the Roberts Daimlers and the Roe-bodied trolleybuses. They were also fitted on the later Park Royal OTV series Regents, but mounted the other way up (upside down!) as also the 1950 trolleybuses (KTV500-601). 4 and 4A Beeston routes – These were originally through routes from Arnold (replaced by the 57) so passed the Villiers Road clock. 9, 54, 65 Mapperley/Carlton via Gordon Road. However the 9 originally ran via Thorneywood Lane and Carlton Road, passing the Alma Road clock. 31 Mapperley via Woodborough Road. Originally however this ran through to Trent Bridge as 35, and would therefore pass the Processional Way clock. 56 and 60 Bilborough via Ilkeston Road. Services not introduced until about 1948 by which time I suspect the decision had been taken not to install any more. 58 Radford via Castle Boulevard. 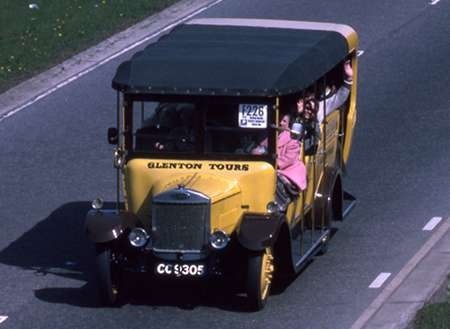 Until about 1953 this ran across city to Sneinton Dale as route 3, and would pass the Cardale Road clock. The clocks also seem not to have been fitted on any joint service routes – i.e. West Bridgford, Clifton or the Basford via Nottingham Road trolleybus routes – which were joint with the Notts & Derby Ripley trolleys until 1953. I am now 44 and grew up in the Bakersfield area and so remember the AECs going up and down Carlton Hill. 39, 72 and 25 were the numbers and I used all of them but the 39 the most when we would go to Wollaton Park. 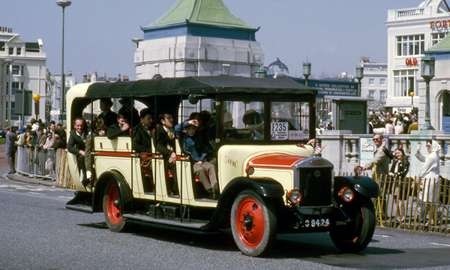 I remember the county council taking down the old trolley bus posts and the suspended central road lights, but the city council left theirs in for many years after that and they began near the old Fina petrol station and went all the way down Carlton Hill and all the way to Lower Parliament Street. I really loved the old AECs, they just looked so right and I thought they would be around for ever. One of my favourite spots was near the old railway bridge on Carton Hill at the junction of Porchester Road. The railway signs were still on the bridge walls advertising various ticket offers and the pipe organ builders, old blue and white tin building stood on the corner of Carlton Hill and Porchester Road with the Coopers arms just around the corner. When the buses stopped outside the organ builders at the traffic lights, they would often struggle at rush hours when packed with people. The junction was much more narrow then and the old traffic lights were cast iron and had the word stop over the red lens in black. These would often stick on red both ways and bring everything to a holt. We would sometimes get off there and feed the horses at the fence at the edge of the field which is now the housing estate. Any more memories from anyone? Intrigued by the advert for the pipe organ builder, David. As a professional organist, I only know one organ builder in Nottingham – Henry Groves. Is it he, or some other? Groves continues, in death, run by his grandson – Jonathan Wallace. The organ builder referred to is Henry Groves who occupied the former St. Clement’s church (a tin chapel)at this location. The railway bridge carried Carlton Road over the former Nottingham Suburban Railway, which had closed in 1951 and had been dismantled by 1954. Thanks Michael. Henry Groves/Jonathan Wallace have quite a good reputation in the East Midlands. Its a small world, I do know Jonathan Wallace and I do a small amount of organ building myself as it is one of my interests as well as buses and railways. I sometimes went down there as a boy to watch them work and that is where my interest started. Groves then moved to the old sports hall at the back of the old Hogarth school at the bottom of Carlton hill near the old Crown pub, (later Smitheys and now gone). Jonathan still works near Nottingham. As you are a professional organist, I could do with some advice as I am trying to get to grips with the Theodore Dubois Toccata in G, with very slow progress. 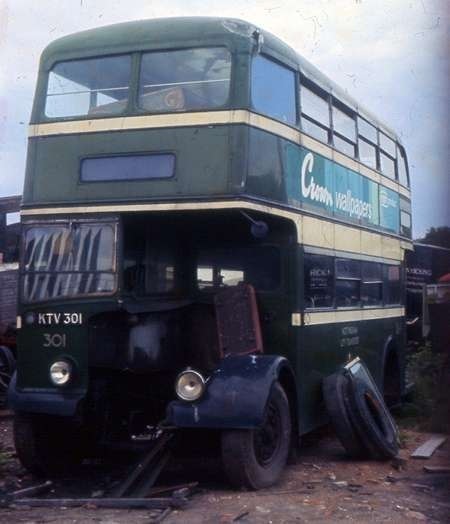 Anyway back to the subject of Buses, Does anyone have any photographs of AEC Regent III bus OTV 161, as I am the current owner and would like to try and put an information board together for the public. David, glad you are taking care of this piece of NCT history. You probably know there are quite a few photos of OTV 161 on Flickr. 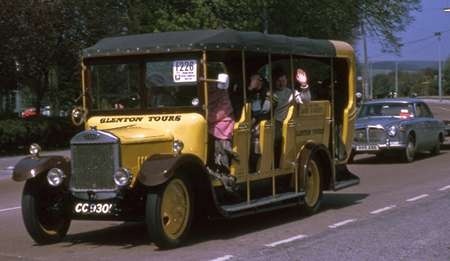 The following is a selection from the Grimsby Cleethorpes Transport collection, from the time when it was with them. Thanks for the shot of 154 Peter and thanks to Stephen for the links to 161. Like the shot of 161 in the Market Square. I have seen a couple of the Grimsby shots before but the others are interesting. If anyone has any dates or details such as last run in Nottingham, routes through its life, time at Grimsby etc, that would be great. I notice the indicator lenses are different when it was at Grimsby as it has the bright orange jelly mould lenses fitted now. There have been quite a few things which I have found during time working on 161 which make up some very interesting questions. Time for these some other time. If anyone has any photographs of Regents on the Carlton route, that would really make my day. I’m pleased that David Morris is now the owner of OTV 161 and has had it back on the road. The late Peter Edgington and myself were the original restorers of 161 during 1981-83. We did the work ourselves, with assistance from friends from time to time, to a limited budget. We tried to ‘capture’ 161 as it would have been around 1960/61 and this involved the restoration of NCT style destination displays front, back and side, a complete repaint and mechanical work. Unfortunately, we were unable to find suitable half drop windows to replace those removed by Grimsby from the fourth bays on both side of the lower deck. I have photographs of 161 during its restoration and I’ll look these out and put together a gallery posting. It would be really great to talk to you some time as I have a lot of questions to ask you. Really looking forward to seeing the restoration photographs you took. I will try and sort out some recent pictures of 161. Is somebody going to volunteer a nice shot (or shots – preferably including front, rear and interiors) of OTV 161, for inclusion on OBP? – This is just a gentle prod – pleeeaase! Does anyone know please whether any of the Roberts AECs (301-341) survived the breaker’s yard? It would be great to see one again. Recent comments brought this section to my attention. See my "Best bits" re Nottingham Area Bus Photos for some of my pics of these Roberts Regents. Sad to see a final, final confirmation that none of these superb vehicles survived into the preservation era and I enclose one of my other pics to confirm that the class pioneer in particular went the way of all such flesh. Here is 301 just about intact (well, apart from the most important bit!) in a scrapyard up Commercial Rd in Bulwell. Unusual in that it still carries fleetnames and numbers – these were normally painted over before disposal. Thank you both for the information and photo. It’s no use me offering to help anyone to restore one then! Very sad.